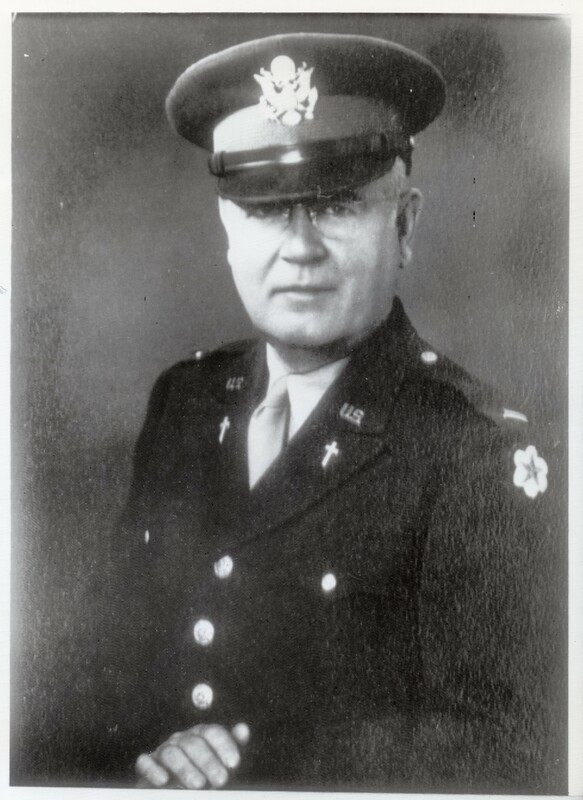 Chaplain Henry F. Gerecke served as a chaplain in the Army during WW2. Following the war he was selected to be the chaplain to the Nazi prisoners during the Nuremberg war trials. The U.S. Army Chaplain Museum has on display Hermann Göring’s gloves that he gave to Chaplain Gerecke. 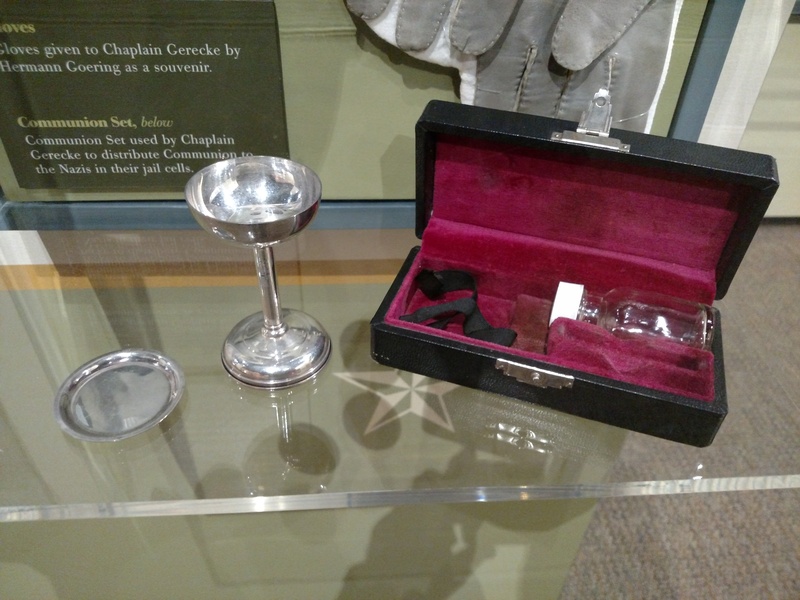 Also on display is the communion set that Gerecke used to serve communion to the prisoners at Nuremberg. There’s much to Chaplain Gerecke’s history that can be found elsewhere but below is an audio recording of Chaplain Gerecke telling his story not long after returning the the United States. Below the video is a newspaper article from the Southeast Missourian about Chaplain Gerecke drawn from an interview with his son, “Hank” and Tim Towsend’s book, Mission at Nuremberg. Some of history’s most notorious mass murderers adored his father, too. The Holocaust stands in time as a horror without precedent or equal. Tomorrow, Holocaust Remembrance Day commemorates the 6 million Jews who were killed by the Nazis during World War II. When the war ended, surviving Nazi leaders stood trial for war crimes at Nuremberg, Germany. While the Allies dealt with these 22 men and their crimes, it fell to Gerecke’s father, Henry Gerecke, a good-natured Army chaplain from St. Louis, to somehow deal with their souls. In the recently published book “Mission at Nuremberg,” Tim Townsend brings the chaplain’s ordeal to life. But for Hank, his father’s story isn’t about remarkable service. It’s about a man whose actions were the embodiment of his remarkable nature. Sitting at his kitchen table in a fuzzy brown cardigan, Hank jokes about his age, his wrinkles, his poor hearing. “I never expected to make it to 93,” he says. He remembers the 1930s in St. Louis and being awed at how well-suited his father was to life as a Lutheran pastor. He was stern but gentle, a man of principle and compassion who did not approve of dancing. A true minister’s minister. Sometimes Hank would notice the faces that filled the pews on hot summer Sundays and see how captivated they were by the week’s sermon. Whether Pastor Gerecke was reminding them of the importance of charity or the endurance of God’s love, his parishioners listened. And many people did want Pastor Gerecke. Hank laughs, recalling how he and his brother, Carlton (whom they called Corky) would spend entire Sundays driving their father back and forth across town so he could hold services with as many people as possible. But as Pastor Gerecke realized that no matter how many chapels he visited, some of the people who needed the Gospel the most would not be found in the Sunday pews. They were in hospitals, jails and other institutions. They were afflicted, marginalized, and as much as they needed his help, he needed to help them. Henry added the hospital and jail to his Sunday rounds and had such a gift for oratory that he even began to broadcast the Gospel on the radio in a segment called “Moments of Comfort.” To Hank, it seemed a product of his father’s greatest skill: his capacity for empathy. When the U.S. entered World War II, it didn’t take Hank and Corky long to join the Army. Among the black-and-white portraits that hang in Hank’s study is a picture of the brothers in uniform at Nancy, France. Their parents’ portraits adorn the opposite wall. Hank’s mother, Alma, looks youthful, smiling delicately. Henry looks about as stout as the Bible he clutches in one arm. It’s easy to see where the brothers got their stocky build and round, German grins. Despite being 50 years old, Henry followed his two oldest sons into the Army in 1943. It was not an easy decision for him. It would mean leaving his wife, youngest son, Roy, and all his congregants. She already had two boys in the war. Two blue star service banners hung in the window, holding the boys’ places until they returned home. She wasn’t keen on the idea of Henry going, but she knew him and understood why he felt he needed to go. Henry spent the last two years of the war serving as a chaplain at a hospital near London. His ministry in hospitals stateside could not have prepared him for what he found on the Western Front. He was constantly needed and always ready to offer a prayer, a message of hope, a cigarette — anything to ease the suffering of the wounded and the dying. Born Heinrich Friedrich Gerecke, Henry had become fluent in German while studying to become a pastor. His reputation for compassion and his experience ministering to prisoners made him an ideal candidate to be spiritual counsel to the Nazi defendants when the war ended. He did not volunteer for the job — the Catholic chaplain already working in Nuremberg specifically asked for Gerecke. It was a heavy proposition. First, it would mean forgoing the chance to go home to Alma. And second, he had seen what the Nazis had done. He had stared into the shadows of Dachau’s ovens and wondered aloud how such a thing was possible. He wasn’t sure he could bring himself to shake the hands of those responsible, much less kneel with them and pray to the same God. What would that mean for him? What would that mean for God? Hank pauses to rub his jaw, appreciating the pressure his father must have faced in that moment. He explains that when push came to shove, his dad was a good shepherd. Pastor Gerecke could not ignore the obligation he felt to help those who needed salvation. After a sleepless night of prayer, he decided go to Nuremberg. He arrived to find the Allied commission struggling to agree what should be done. The war was over, but Western society had to reconcile a belief in due process with the ostensible need for retribution. The blood of millions cried out for justice, but the enormity of the alleged crimes was overwhelming. Gerecke left earthly justice to the lawyers. He would have enough on his plate without getting tangled in the legality of the proceedings. He was given a copy of the official record of “crimes against humanity” the defendants, his new flock, were charged with. It filled 22 volumes. Hank eventually read them himself. Years later, he leans forward at his kitchen table and folds his hands, looking for a way to describe the numbing effect of reading page after page of atrocity. He trails off, stares at the red woven tablecloth for a moment. Suddenly, he seems hollow, as if it’s too much to fathom. As if it’s too much to imagine how millions of people weren’t just murdered — they were erased. Annihilated. In the most unimaginable ways. Confronted with the brutality of the truth, Pastor Gerecke did what he did best: empathize with the prisoners. Hank saw that his father’s great gift had become a quiet burden. The world looked at Nuremberg and saw crimes. “Dad saw human beings,” Hank said. Most of the prisoners rebuffed him initially with varying degrees of scorn. They had run off the original Protestant chaplain, a man named Carl Eggers. They had found his relative teens contemptible. But Pastor Gerecke was different. He dealt with the men on their level. He had a naturally easy presence and a disarming sense of humor, but most of all it was his unyielding sense of integrity the Nazis came to respect and trust. He treated the prisoners with dignity and offered them a path to salvation, but would not offer them the sacrament of communion unless they had convinced him they were truly penitent. Within months, the small courtyard chapel was full. A former SS officer played the church organ. Hermann Goering, the intended heir to Hitler himself, sat in the front row. When a rumor circulated among the prisoners that Gerecke’s tour was finished and he planned to return home, they sent a letter to Alma begging she permit them to keep her husband for a few months longer. Pastor Gerecke was doing something right. But time was running out. Eventually, 11 of the accused were sentenced to death by hanging. Once again, Gerecke was in constant demand. He carried his Bible from cell to cell, tending to his charges. On the night before executions, he visited Goering. The two men had become close since Gerecke’s arrival. Then, to Gerecke’s amazement, Goering asked to celebrate the Lord’s Supper. Gerecke’s entire ministry lay in that moment. He had come to Nuremberg to help this man find salvation and on the night before his execution, he was asking for Holy Communion, the fullest expression of the Christian faith. But Goering would not recognize Christ. Anguished, Gerecke refused him the sacrament. Goering killed himself using cyanide later that evening. Gerecke would face harsh criticism for refusing to commune Goering, but he never doubted he’d done the right thing. Hank sits up a little straighter at his kitchen table and sets his brow in the same steadfast expression his father wears in the black-and-white portrait. He’s proud of his father’s integrity and courage. He leans forward and taps the table with his index finger. Hank remembers calling his father that day. He knew his father dreaded having to walk the condemned to the gallows. The executions took place that night as scheduled. The sun rose the next morning. Henry Gerecke found strength in an axiom he had adopted while ministering in the hospital in England: “This too shall pass.” He wore a ring bearing that inscription for the rest of his life. Two weeks after the trials ended, Gerecke went back to the Midwest — back to his Alma, back to his flock, back to the afflicted in jails and hospitals. Hank says it was obvious the ordeal had taken its toll on his father, but his experience at Nuremberg had reaffirmed his commitment to empathy. Once he insisted that Hank visit the ad hoc mental ward in what was then the Southern Illinois Penitentiary in Chester, Ill. Hank, who was chief of police in Cape Girardeau at the time, saw the mentally ill prisoners’ suffering and knew why his father had sent him. Newspaper article (with photo) from http://www.semissourian.com/story/2074449.html, accessed 12 June 2016.